Happy Monday everyone! I hope your week is off to a great start, I'm spending the day studying for an Environmental Sociology midterm... fun! 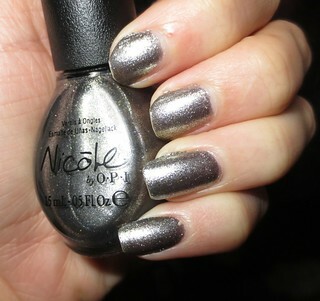 I'm taking a study break to share one of Nicole by OPI's Modern Family polishes with you, A Phil's Paradise*. 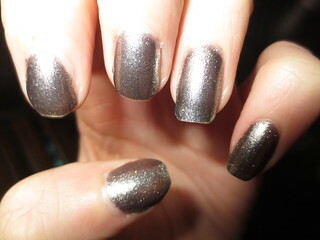 A Phil's Paradise is a beautiful pewter grey polish. Just by looking at this polish in the bottle, I was wary, wondering if it would be sheer or opaque. Luckily, this polish turned out to have a great formula, and opaque in two coats. However, I was watching The Walking Dead with very few lights on, and I added a third coat just to be safe. Oops! This polish is made up of tiny silver and gold shimmer, and you can really only see the gold colour up close. A Phil's Paradise is a fairly unique shade in my collection, I don't think that I have anything like it! I think this polish would be great in the Fall and Winter months, as it's a bit on the darker side. Have you picked up any shades from Nicole by OPI's Modern Family Collection? What do you think of A Phil's Paradise?